Have you, as a space exploration enthusiast, ever wondered what space-related activities you might have missed or forgotten? 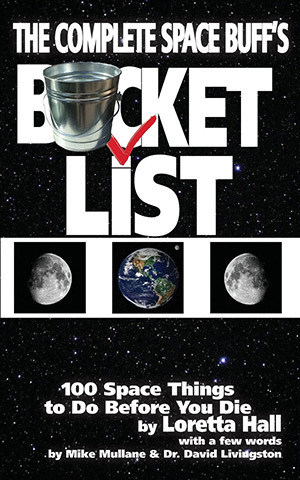 Then The Complete Space Buff’s Bucket List is a handy tool for you. This short 5×8-inch paperback consists of 100 space-themed activities to participate in and places to visit. The book includes the usual items you may have already accomplished, such as watching space-themed movies and visiting museums and planetariums. But there are also a few entries that might surprise you and prompt you to include as future endeavors. The book starts with short introductions by shuttle astronaut Mike Mullane and Dr. David Livingston, host of The Space Show. Its pages then count down the list, starting at #100: Reading Sagan’s “Cosmos” or “Contact” and ending with #1: Taking a trip into space aboard one of the private endeavors. Each item on the list consists of a single page with one paragraph describing the activity, followed by one or more links for more information and a small 2.5×4-inch related photograph. A large part of the fun of this book is finding items you’ve already accomplished. When I received the book, I immediately opened it and told my wife, “Oh, look, we’ve done #85: Barringer Meteorite Crater and #82: Skydive indoors! And I’ve always wanted to visit #84: Biosphere 2 in spite of that awful Biodome movie!” Then we both laughed at #42: Eat Astronaut Ice Cream, which, of course, we have not only done but also forced upon our young children during a museum visit. The book also worked as a great reminder of places I always wanted to visit and had forgotten, such as visiting #50: Area 51 and #30: The Roswell International UFO Museum and Research Center. As I perused this small book, I was hoping to find novel activities I had never considered, and I was not disappointed. I have added to my bucket list, although with trepidation, #12: Find Out If You Are Smarter Than a Chimpanzee. The text encourages you to test yourself and provides a link to a 75-page NASA document of the activities and test results performed by Enos, the Mercury chimp. And, after that, I cannot wait to go to Brooklyn to #6: Wear a Real Space Suit and go through a two-hour experience of suit activities such as hitting a golf ball a la Alan Shepard (Apollo 14). The author, Loretta Hall, is a writer and active NSS member, and freely admits in the appendix that readers may have their own ideas of what to include in such a list. She adds pages in the back for readers to create their own bucket list, plus a page of “near-miss” activity suggestions that did not make the top 100. She also includes space books and magazines to read, and “not-to-miss” space movies that complement her list. Overall, the book is a compendium of items you would expect, some funny additions, and a smattering of unusual items. Part of the fun is recognizing and checking off what you’ve already accomplished, trying to shoehorn into the list similar accomplishments, and inspiring yourself to go after activities you’ve forgotten or never considered. It is also a worthwhile addition for sharing with family and friends. Who wouldn’t want to spark enthusiasm in a young mind with easily accomplished space-related activities such as throwing water on a barbeque briquette so that he or she can #9: Smell Space? This book provides ample opportunities for NSS members to share their enthusiasm for space with others.